President Obama has said that his stimulus plan will provide the “largest investment increase in our nation’s infrastructure since President Eisenhower created the national highway system half a century ago.” It will create hundreds of thousands of job for people rebuilding railways, bridges, and roads. While I applaud his concern about jobs and improved safety, I worry that in the mad rush to pave we may lose a bit of history—the handful of cobblestone roads still dotting Seattle. The Wilkeson sandstone lithified from thousands of feet of sand deposited 40 to 50 million years ago in the Eocene Period when western Washington was flat and subtropical. Palm trees, swamp cypresses, and tree-sized ferns grew in the moist (40-100 inches of rain), bayou-like environment. Waves from an ocean that spread to the west washed ashore on beachfront property, now covered by the urban metropolises along Puget Sound. The only mountains that existed rose far to the east along the Washington-Idaho border. Rivers and streams washed out of those mountains and dropped sand in a coastal lowland dotted with seasonal lakes, swamps, and lagoons. 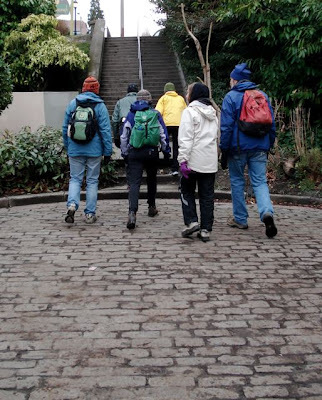 In addition to sandstone cobbles, brick was another important paving material and can still be found on a few Seattle streets. Local manufacturers used a clay deposited in a proglacial lake, which formed in advance of the ice sheet that covered Seattle during the last Ice Age. A production capacity of 70,000,000 bricks a year made King County the largest producer of paving brick in the country. At one time, these bricks covered streets in Portland, San Francisco, Tokyo, and Los Angeles, as well as roads in Chile, Argentina, and India. According to the last official survey I could find, conducted in 1993, only 93 of these historic streets remain in Seattle; most have been paved over, their stories lost to drivers who don’t want the jarring ride. I do not mind them. I like the connection to the past and consider it a privilege to drive over the ancient cobbles and rustic bricks, although I try to take these roads when no else is in the car with me. If you think they are bad in a car try biking down a brick/cobble street sometime. Yeah, I know. I have always been impressed with the riders in Paris Roubaix and how they do it. I roller bladed down one once, that was a very long trip. 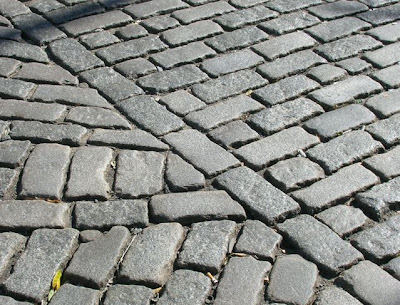 (i) in Belgium, a famous source of cobblestones for roads was the "Psammites de Condroz" — very widely used. (ii) In New York State, near Rochester, there was a mid-19th century fashion of constructing "cobblestone houses" — actually rounded stones, mainly from Lake Iroquois beaches (and modern L. Ontario), set in stucco. The practice was imported to Ontario and a dozen or so buildings can still be seen in the town of Paris (all buildt by a single stonemason).